I love trying new projects so an Altered Tag Swap and Challenge was right up my alley. I have made several tags but none that I thought qualified as "altered". The swap I entered had the following guidelines: The Tag size is #8 (6 1/4 x 3 1/8) , it had to have chipboard added to the back of the to make it sturdy, It had to have at least 3 dimensional embellishments (flowers, rhinestones, fabric, resins, metal, ribbon, trim etc. ), and it had to include a stamped sentiment. Seemed simple enough. Here is what I came up with.. I really loved the way it turned out. Since I didn't have a pre-cut tag that size, I made my own from cardstock and backed it with chipboard. I was swapping tags with a sweet lady that lives in Iowa, so I used an old Atlas page of Iowa on the background. The "moments" sentiment and the butterfly and postmark were embossed with black embossing powder. 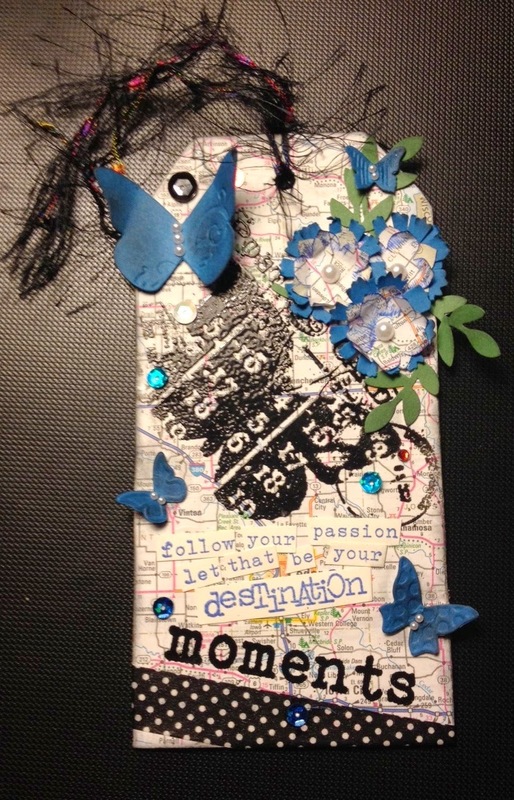 The sentiment "follow your passion, let that be your destination" was stamped in brilliant blue Stampin' Up! Ink onto white cardstock and then words cut out and glued on the tag. The ink matched the blue on the atlas paper perfectly. I used Stampin' Up! Beautiful Wings Sizzix Embosslits. I just LOVE how they cut and emboss and that it has 4 different sized butterflies. The flowers were punched out of both blue Stampin' Up! Cardstock as well as atlas paper and layered with a Pearl embellishment in the center. The leaves behind the flowers were punched with the Stampin' Up! Bird Builder Punch. I daubed a little black ink on the edges of the butterfly and part of the embossed portions so they looked a little more "antiquey". I added a strip of washi tape to the bottom, glued on some sequins here and there and added a black fiber ribbon and that was it. I was pleased with how it turned out. I hope you like it and that you will try one as well. Thanks for looking! Stay crafty and cherish your blessings! Oh my, have you noticed all of the cute alligator punch art cards on some of the card sharing websites and Pinterest lately? I have seen so many great ones. Some have the entire card shaped as an alligator and some just have the alligator on the card. Once I received the "See Ya Later" Sale-a-bration Stampin' Up! stamp set I just KNEW I had to try this alligator punch art! Since I didn't have the SU Petite Pennants Builder punch I improvised and cut out a free-hand triangle with 2 sides longer than the 3rd for the head. For the teeth, my intention was to use my pinking hearts border punch strip but when I punched the hearts I noticed under the punch was a perfect little zig zag strip that made fabulous teeth! I cut out a banner and then I actually did something I have never ever done .... 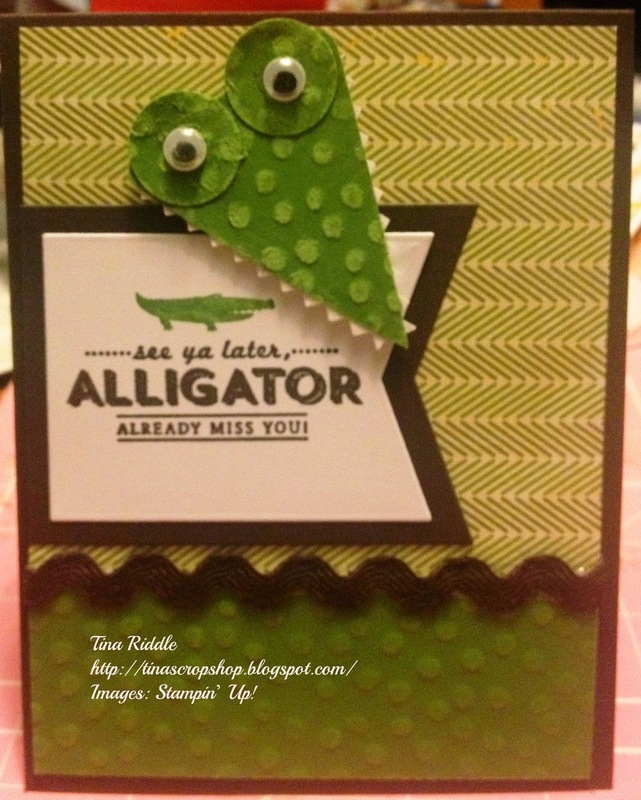 I stamped the see ya later, Alligator sentiment without stamping the alligator image (I covered it with Washi Tape when inking, and then I colored in the alligator with a green Stampin' Up Marker so that when I stamped it, I ended up with a green alligator. I liked the way that turned out. But, my very favorite part of this project was the cardstock. I used the coredinations "Gumball green" cardstock that I had purchased on clearance and I ran it through my big shot in my distressed dots embossing folder. Once the cardstock was embossed I sanded the dots and I absolutely LOVE how they turned out! I hope you will too!